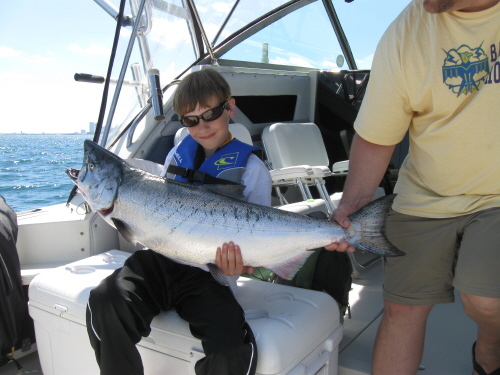 NY Fishing Reports: Milwaukee Salmon, Twenty Pound Naturals! Milwaukee Salmon, Twenty Pound Naturals! Coho and Chinook Report 6/26/2016! Join us in Milwaukee! Master Evan Krull after a long battle landed this natural 24 pound 12 ounce Chinook. We had a ball almost a grand slam. Brown Trout was the only fish that was missing. To get my fish reports and how to videos first go to http://www.jimhirt.com By subscribing you will keep ahead of the other anglers. When I post you will get it fast! Mixed bag all week. Very consistent, lots of fun. Chinooks and Coho have dominated the catch and lots of Rainbows too. Chinooks went for Magnum Reaper Fish n Chip spoons in chartreuse /silver. We had several over twenty pounds this week. White or green Howie’s flies also working well run behind a white flasher. The big Chinooks are active 90 down on downriggers. Reapers and Vulcans made by http://www.badgertackle.com have been working for us. They have a Buy Four get one free special this season. The small silver Vulcan in green or blue has also been good on the downriggers. Run them 75 feet behind the ball 55 feet down to the bottom. Coho have been on standard size Howie flies. Running all wire divers now with a 1.5 set at 125 feet of line out. Brown Trout action was just ok on 2 color lead core with small spoons. One here and there on the Vulcan Silver Sky. For all fish speed has been very critical with the warmer 65 degree water. The temp break to 53 is down 50 feet. I use the Depth Raider to measure speed and temp at the ball. The boat speed of 2.0 to 2.2 has been best. The faster speed triggered the Chinook action. I fished mostly out over 80 feet again. East wind has pushed the warmer water in. Fish 80 to 200 feet. Near shore action on McKinley pier has been very slow with only a few Browns being caught. We did not get out over 120 feet of water yesterday. Head 55 degrees north in Whitefish Bay and set lines in 80 feet. Troll north east have a great fishing season. Let's go fishing! Note We are offering an extra hour for $35 when added to a five hour fishing charter. Jim charters out of Milwaukee, WI. with Blue Max Charters. He can be reached at 414-828-1094 or visit his web site at http://www.bluemaxcharters.com Copyright© 2016, James J. Hirt, All Rights Reserved.